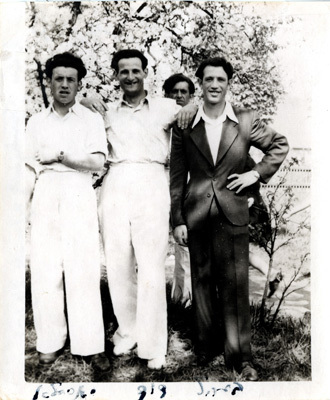 Left to right: Joe Engel; David Zryb (Irene's husband/Joe's brother-in-law; the couple married after the war); Ben Engel (brother); in the background is an old friend, unknown name. Salzheim D.P. camp, near Frankfurt-on-Heine, 1946.